Wishing all a great time over the Christmas New Year and above all, stay safe. I'll couple the wishes with a New Year's resolution to publish more articles! 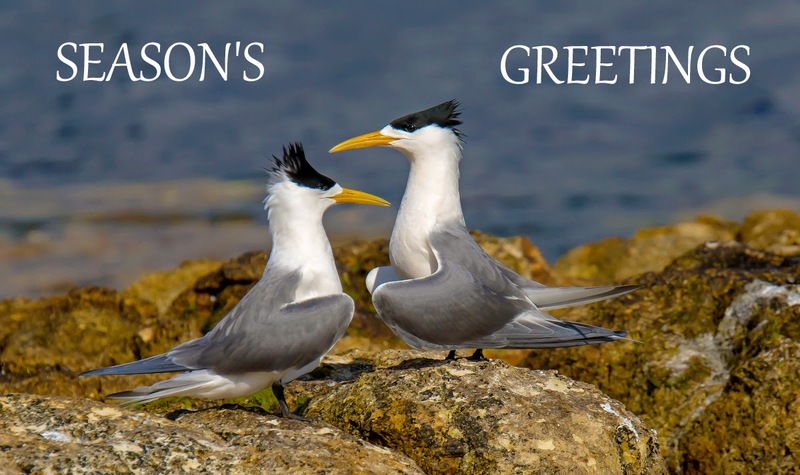 The accompanying photograph of a pair of courting Crested Terns ( should now call them, Greater Crested Terns! ), was taken a few weeks back on the shores of the River Derwent. No doubt they are now off breeding. On my frequent birding outings to the South Arm peninsula, I often make a detour round the Lauderdale Canal. In the summer months there's little here except the large numbers of domestic ducks that have either escaped from their owners, or just dumped. But occasionally, there's a couple of Pelicans or the flock of Little Black Cormorants that "fly in-fly out" looking for a feed. During the autumn and winter, there's an increase in ducks with Chestnut Teal (and the odd Grey), Black Ducks ("real ones", not the "mongrel" Black x Mallards and heaven knows what else, that's have reached epidemic proportions) and even the odd Hardhead, and feeding on the margins Pied Oystercatchers. 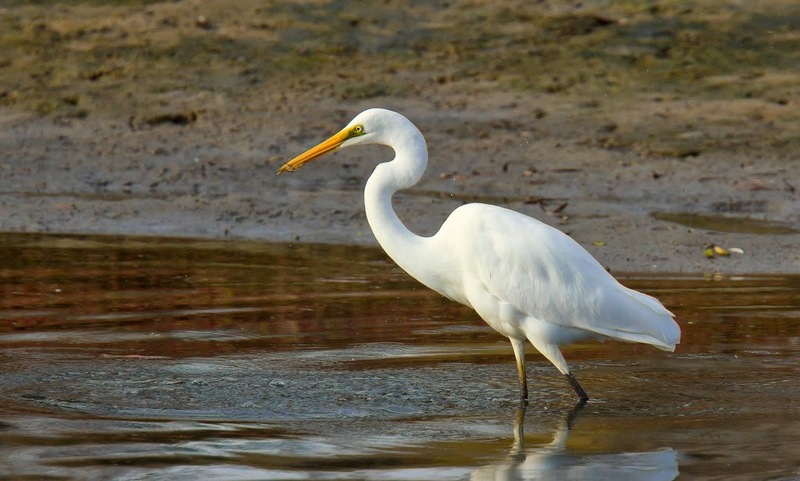 My interest on this morning was a Great Egret that I had seen feeding in the waterway a few days earlier. 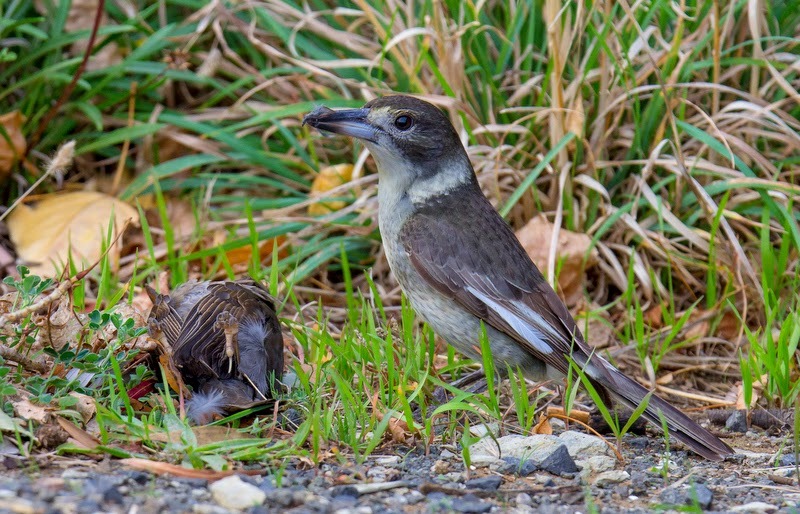 As I neared the eastern end of the canal, I noticed a movement out of the corner of my eye, which before losing sight of it, I identified as a Grey Butcherbird apparently feeding on a 'corpse'. I reversed to have a closer look and thought this might have some photographic possibilities, although it was heavily overcast. The Butcherbird seemed quite comfortable with my presence, provided I stayed in the vehicle. The 'corpse' proved to be a female Blackbird, probably a recent road casualty, and I looked forward to getting a few shots of the Butcherbird feeding. That didn't happen. Over the next 20 minutes or so, the Butcherbird moved the body nearly 20 metres and into the thick scrub. The recently dead Blackbird would weigh around 80 grams or so, and the Butcherbird not much more, so it was quite some feat. As you can see in the lower photo, it didn't drag the corpse, but lifted it and walked forward, which was obviously an awkward way to go about it, but it eventually managed to secrete it in the scrub. Whether this is normal behaviour or not I don't know, but the Butcherbird gets its' name from the practice of some of its' relatives, hanging up their prey on thorns on suitable shrubs. As you may see by the accompanying images, I caught up with the Great Egret too. I had managed a few shots on an earlier visit, but the bird was clearly 'nervous' and I was reluctant to "push" too hard for fear of the egret departing. On my second visit this egret had perhaps become used to the passing locals and allowed a quite close approach. On my first visit, with the water level much higher, I had felt almost sorry for it. It had to wade out into the deeper water to catch prey, and almost completely submerged its' entire body to do so. Fishing only a metre in front of it were 2 Little Black Cormorants, catching small fish on almost every dive and a White-faced Heron, only half the size of the egret, content to pick prey off the water surface. 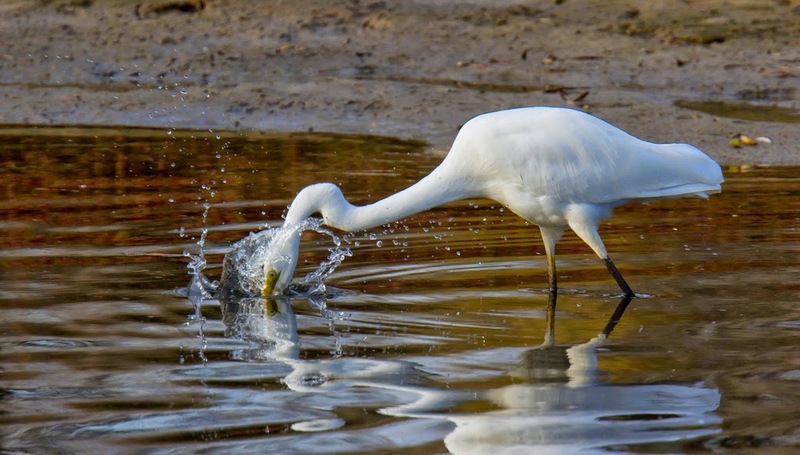 In the lower image you may just be able to see the small fish that it has in its' bill, which reminded me of watching Great Egrets in the United States fishing in the backwater of a river where the water was receding fast after a flood. They and a Belted Kingfisher were feasting on the fish floundering in the shallow water. Incredible how many fish they managed to consume in a short time. 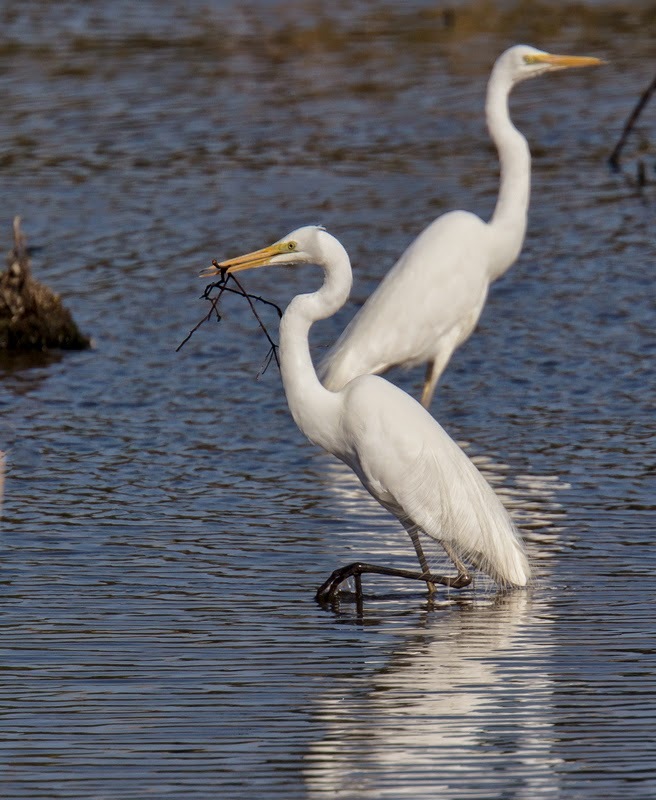 A recent mention of several Great Egrets at Gould's Lagoon reminded me of a similar incident I had witnessed there in January. 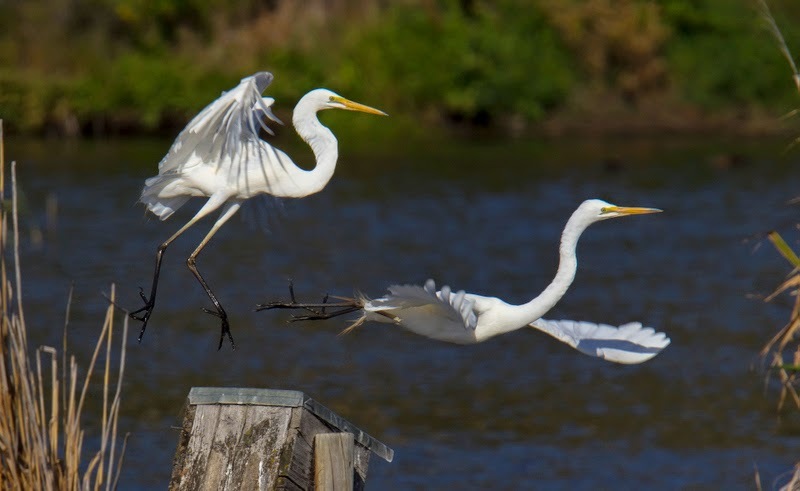 Great Egrets are normally considered winter visitors to Tasmania, usually in quite small numbers. 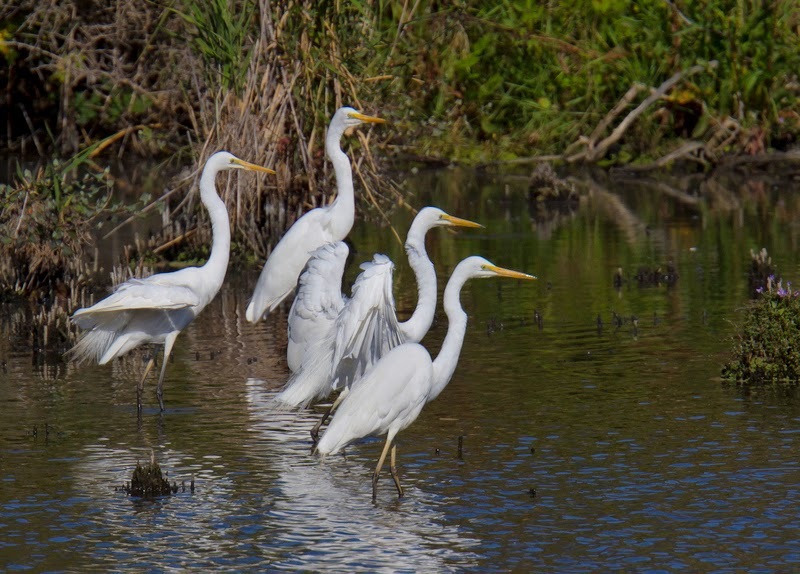 I suspect that the same ideal breeding conditions on the Mainland, of a few years ago, that caused the sightings of so many 'rare' ducks in Tasmania and especially so at this lagoon, also proved beneficial to these egrets. I usually arrive at this lagoon with some expectation of an interesting sighting, but after the excitement of so many rarities last year, which included Pink-eared and Freckled Ducks and Baillon's Crake, I was not that optimistic on this occasion. A quick scan of the lagoon from the road showed there were few duck, save for several Australasian Shoveler and a single Freckled Duck. A solitary Australian Crake scuttled away into the reeds, Usually considered a good sighting, it's become almost commonplace here recently, and I rarely pay a visit without seeing one or more. Lastly I looked at the trees on the far side of the lagoon, that often houses roosting cormorants, sighting 40 or so Little Black Cormorants together with a few Great and Little Pied Cormorants, and at the very tops there were at least 10 Great Egrets. It warranted a closer inspection. From the hide walkway I counted 14 Great Egrets, a high number for this lagoon, scattered among the tops of the eucalypts. 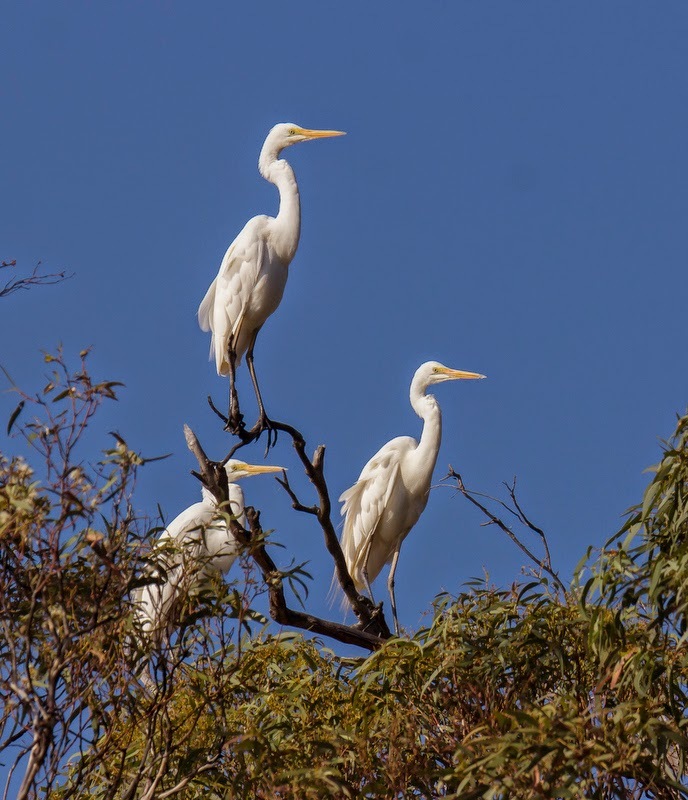 There's often one or two egrets here, particularly during the winter, as there are in the nearby bays and marshes of the Derwent River. I suspect that the very high tides at the time, had forced them to this roost site. I decided on a closer inspection, stopping briefly to photograph the Australian Crake that usually hangs out around, and occasionally under, the walkway. I took several shots of the egret roost (top left), but they were clearly very nervous of my presence so I retreated back to the hide. A few minutes later the entire roost took flight when two walkers passed underneath the roost. The cormorants flew off, but the egrets scattered around the lagoons on both sides of the main road. From the roadway I watched those on the main lagoon for the next 30 minutes or so. Roosting sites were obviously at a premium, as the image of the two in flight show, as they jockey for position on top of a defunct nest box. Another individual picked up a large stick, carrying it around and later flying off with it. I'm not sure why, although it's easy to make assumptions. Having had my fill of photographing and watching those egrets on the main lagoon, I wandered over to the other smaller lagoon, where 5 had alighted. They were clearly uneasy, but the presence of a White-faced Heron feeding along the water's edge, unfazed by me, seemed to calm them down. All was well until an empty log train passed by, causing all the egrets to take flight, flying around until it had long passed. The heron continued feeding oblivious to the train and the panicked egrets. They finally alighted in a group as shown in the lower shot. Not wishing to add further to their nervousness, I left. An enjoyable, and at least in Tasmania, an unusual event. 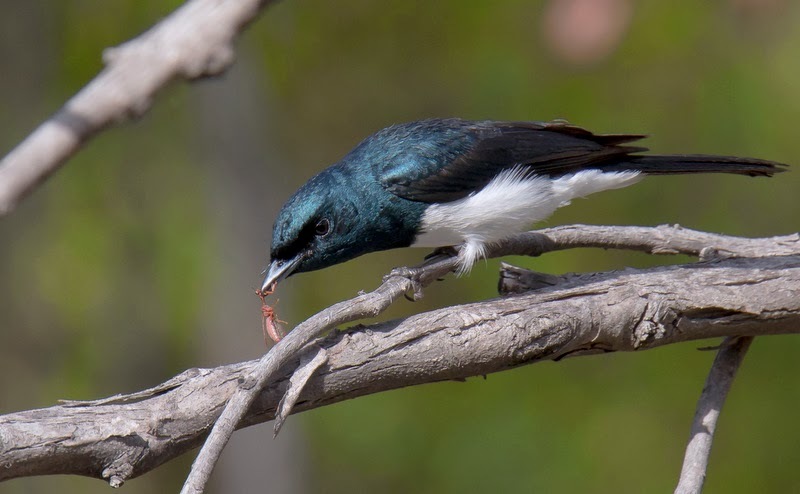 The rasping call of the Satin Flycatcher, resonating through woodland and forest is, for me, one of the most anticipated birding events of every spring. "Satins" are one of the last of the summer migrants to arrive in Tasmania and among the first to leave. Being almost exclusively insect eaters and given the unpredictability of our summers, especially so this year, that's probably a wise move. Although they can be very vocal and their calls may be heard a kilometre or more away on a still day, they can be surprisingly difficult to locate. 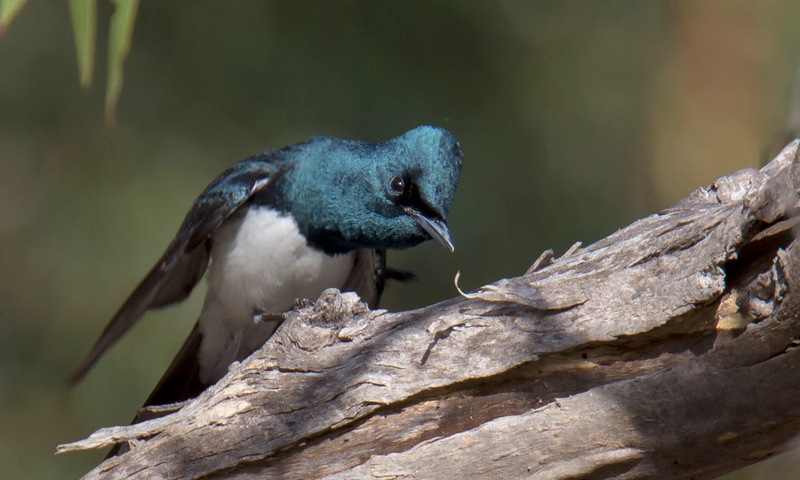 Largely occupying the tree canopy and being only around 170mm in length doesn't help and males often call and move and call and move, making it a somewhat fraught business. They are of course proclaiming their territory, and several pairs may occupy adjacent areas, and occasionally disputes break out between males. Mostly this is just a verbal joust, with crest raising and the characteristic tail vibrating and occasionally followed by chasing. So I feel fortunate to occasionally manage a close encounter with these birds and the accompanying images are the result of one of these occasions. I stood at the top of a small shallow valley, a favourite spot of mine, giving views into the canopy of the small peppermints. Almost immediately two male Satin Flycatchers shot past, one either side of me no more than a few centimetres away. One returned quickly (in triumph?) and perched just behind and above me. I didn't need to turn and confirm the ID, the vibrating tail apparent in the cast shadow said it all. For the next 40 minutes or so, I watched the antics of one, sometimes two, family groups of "satins" as they went about the business of catching insects to feed their offspring. The most surprising events were their fearless defence of the young. I watched as Grey Shrike-thrush and Yellow-throated Honeyeaters were seen off, both of these species themselves, quite pugnacious. Others seen off included Black-faced Cuckoo-shrikes, a Fan-tailed Cuckoo, Black-headed Honeyeaters and Dusky Robins. The male "satin" (below) with an evil look in his eye, (if only looks could kill!) ambushed a shrike-thrush, physically attacking it and chasing it high into the top of a dead gum over 100 metres away. But this pales compared to the combined efforts by two males, who took on an juvenile Grey Currawong. Unseen by the "satins", an adult and juvenile currawong had landed in the Native Cherry alongside me and all was well until the juvenile flew down to pick up a "cherry". It was instantly spotted and a spirited attack by two males ensued, which included landing on the unfortunate bird and pecking it vigorously. The young currawong seemed nonplussed by the event and just allowed the attack to continue before beating a retreat pursued by the males. The adult currawong wisely stayed concealed in the dense foliage of the cherry and flew off when it appeared safe to do so! In between seeing off the interlopers, I watched both males and females catching insects, mostly in mid-air, but occasionally from the woodland floor. The male pictured above with an insect (love to know what insect) at one point dropped it, and the flycatcher showed great agility in recapturing it before it had fallen a metre. Only one bird managed to avoid being seen off, a Shining Bronze-Cuckoo. The flycatcher had passed within a metre or so of it several times without event. Although the cuckoo was only about 20 metres away and straight in front of me, I had failed to notice it until it briefly moved to pluck a hairy caterpillar from a nearby leaf. Perhaps its' cryptic colouring kept it 'safe', or perhaps the flycatcher didn't see it as a threat. Watching from close quarters these highly animated flycatchers going about their business was an experience up there with the best. What a privilege! On and off during the last few months I have followed the several pairs that occupy Pilcher's Hill Reserve at Gielston Bay on Hobart's Eastern Shore. 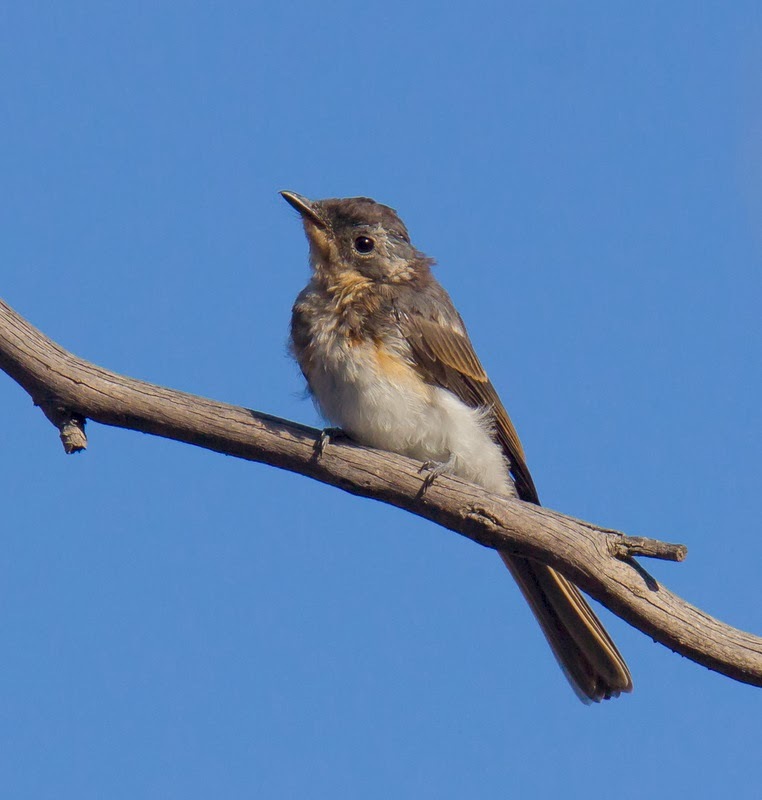 My visits have made me painfully aware just how little I know about these flycatchers, and as always, every piece of information gathered leads to even more questions. I had, for example never seen a juvenile (image at right) and didn't realise how rapidly they moult through the various plumage states (I'm still not sure I fully understand this). Do some males arrive in immature plumage--basically the same as female plumage (top left)--and change during the summer to full male state? I photographed two males that were still showing remnants of immature plumage in early January. 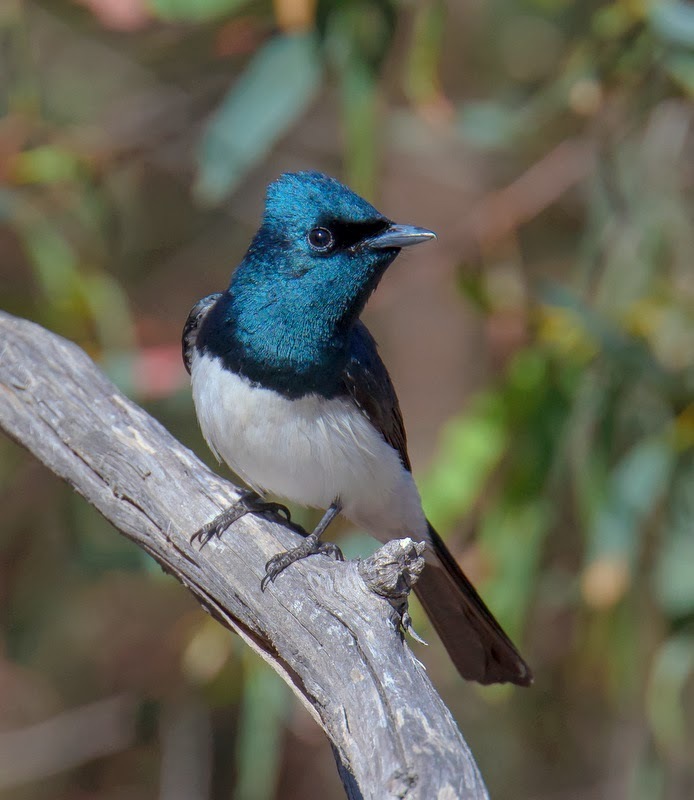 Satin Flycatchers are found widely in the taller, often wetter, eucalypt forests and my impression is that they have increased in numbers over the past several years. My reason for thinking this is that, at least in the south-east, they now occupy areas not previously used, such as more open and drier woodland with only modestly tall trees. Such impressions can be misleading as I've noted this year that I've seen many more Flame Robins and an apparent "crash" in Scarlet Robin numbers. Swings and roundabouts? Time will tell. Around the Hobart area "Satins" may be found (or at least heard!) in most of the reserves, such as the Waterworks Reserve, lower areas of Mtn. Wellington Park, Risdon Brook Park and the Meehan Range and other areas of similar habitat. Enjoy the Christmas and New Year holiday, but please stay safe. 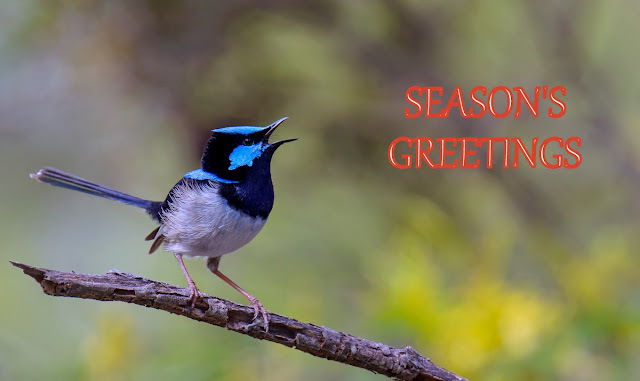 The image is of a male Superb Fairy-wren, a common species of the east and south-east of Australia, including Tasmania. It was recently voted Birdlife Australia's favourite bird, with the Australian Magpie coming in a close second. A big thank you to the regular and occasional visitors and especially to those who take the time to comment. A recurring health issue has rather curtailed my birding activities of late, so I must apologise for the paucity of articles. The second encounter took place a couple of weeks later and less than a kilometre from the Welcome Swallow photo opp. mentioned below. I have taken a little, some might say a large, liberty with suggesting they are both "swallows", because they are not related. They are both summer migrants to Tasmania. As might be suggested by the bill colour, woodswallows are more closely related to Butcherbirds amd Magpies. 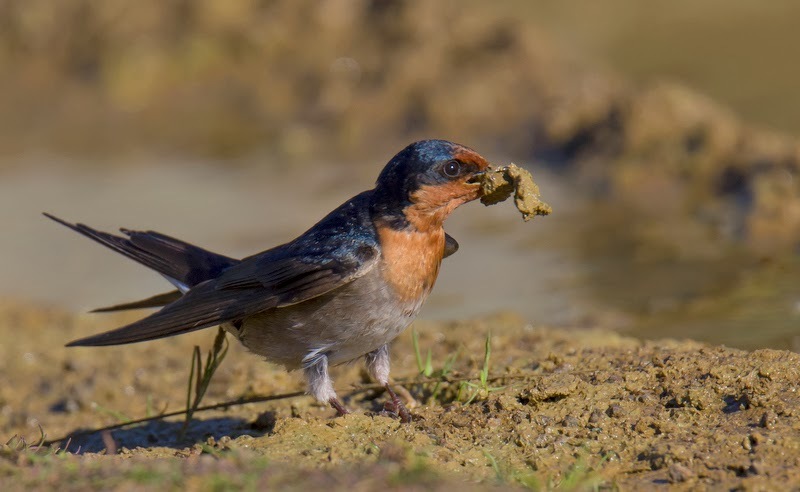 They are a little longer than Welcome Swallows, but weigh in at around 35 gram, over 3 times heavier, a solid, often pugnacious, bird. They are usually found in open woodland and often nest in small colonies of a few pairs. Their nests consist of twigs and grass, often placed in the fork of a gum and, in my experience, are among the easiest nests to find. Like swallows, they feed on flying insects, making forays from chosen vantage points. They will also forage for food on the ground among the leaf litter, particularly on cool mornings. On warm summer days they can be seen soaring often to great heights chasing flying insects, sometimes in flocks numbering over a hundred. They seem somewhat drab birds, but in the hand, the subtle smokey pink brown body and dark blue grey wings are particularly beautiful--my shots, taken on a dull, overcast day, do not do them justice. I was returning from a brief visit to Goat Bluff, on a showery, windy day that had few bright spots save for a fleeting, but exhilarating view of a Peregrine Falcon as it "rushed" by. As I turned off the highway, I noticed a bird in the middle of the road which I couldn't initially ID, and pulled off to the side to use my binoculars on it. 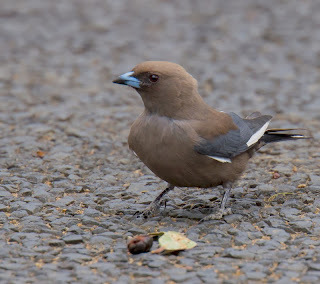 It turned out to be a Dusky Woodswallow, but what was it doing in the middle of the road? In these situations I invariably take a photograph or two and identify the prey on my PC later, which I did here. My first thoughts were that it had a chrysalis that it was trying to 'unravel'. It was hammering away at whatever it was, raising itself to its' full height and 'crashing' down forcibly onto the prey. A passing car caused it to fly off briefly, returning to the road some distance away. Later, on the PC, I could see that the prey was a moderate size beetle, somewhere around the size of a Dung Beetle. Obviously the road made a suitable 'anvil' to hammer the beetle against. Woodswallows are in my experience surprisingly resourceful. On a warm late summer day, I stopped to watch a flock of Yellow-rumped Thornbills feeding on the edge of the road. I couldn't make out what they were feeding on, but assumed it was probably seeds. While standing there, I noted, sitting on the power lines some 100 metres or more away, several Dusky Woodswallows. My thoughts drifted back to the Yellowrumps as I tried to work out if I could get close enough to photograph them, but a passing car put paid to that and they flew off. 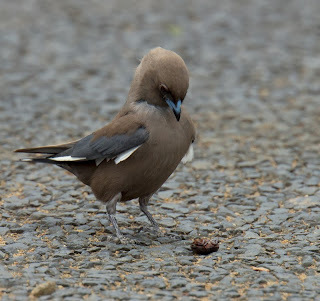 However looking down the road I could see the woodswallows were now flying at speed back and forth along the road, obviously catching some unseen prey. I moved closer. Another passing car and a repeat of the previous excursion from the power line by the woodswallows. Then the penny dropped! The woodswallows were waiting for the passing cars to stir up clouds of very small 'midges' from the roadside and they were taking full toll of them as they were briefly disturbed. I sat and watched for some time, mesmerised by their actions. As I said, surprisingly resourceful. Before spring becomes just a distant memory, I'll relate a couple of encounters with two of our migrant birds. The first is an event that I've often watched, usually from afar, and in recent times made attempts at photographing them, which requires a close approach. The species in the first attempt was the Welcome Swallow, a common enough species in Tasmania during the warmer months, with a few managing to eke out an existence during our winters. 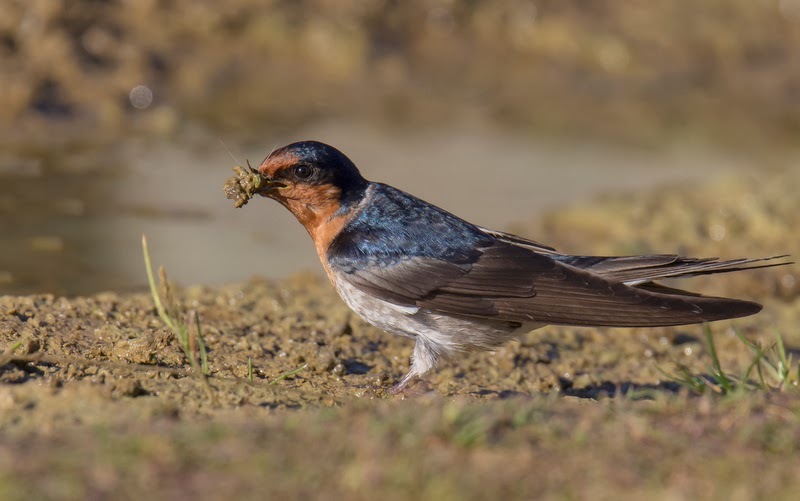 I say "eke" out, because these swallows feed almost exclusively on insects, usually caught in flight, and there are precious few insects about in the colder months. The venue was the car park of the popular scenic spot, at Goat Bluff, near South Arm. I had intended to wander through the nearby heath, but the car park was near full with the cars of surfers, the western side of the bluff being a popular surfing spot under certain conditions. I was about to drive back out when I spotted swallows coming to a muddy puddle close to the cars and stopped to investigate. I correctly guessed they were collecting material for nest building--they nest in crevices on the nearby cliffs, a far cry from their usual choice of buildings and road culverts. They were seemingly oblivious of the comings and goings of cars, the slamming of doors, the loud music and the banter of the surfers as they donned their wetsuits. It seemed a possible photo opp..
As I mentioned earlier, I had photographed them here before, but the results were far from satisfying. These are birds with very short legs not 'designed' for walking and from my previous attempts a low angle was the "go". I sat down beside one of the large boulders dividing the car park into sections, probably no more than 6 or 7 metres from the small puddle that they were using and waited. At first I thought I may be too close and was about to back off when the first swallows returned. They flew over me, twittering, and after a few flybys decided I was non threatening and alighted at the far end of the puddle and gathered material. I'm guessing that their drive to breed and the opportunity of gathering nesting material from a source rapidly drying up (the sole puddle in the car park) is a strong motivation. I sat there for perhaps 20 minutes, punctuated by their visits and the frequent arrival and departure of numerous vehicles passing only metres away from me. A 'kindly' surfer came over to tell me that he had recently been bitten by a jack jumper at the very spot I was sitting. That put me in a slight dilemma! The bite from a jack jumper (an ant c.2cm long) is extremely painful. However, I had unwittingly elected to sit in a slight depression that was wet from an overnight shower and this had permeated my clothing through to my skin--I had a very wet backside. I decided that no self respecting jack jumper would come close--I thanked him for his concern. Individual pairs arrived together, always doing a flyby first and both birds collected material at the puddle, both dry grass and mud, sometimes one or the other, other times both. For a bird only weighing around 10 grams, they seemed able to fly with a considerable load of mud and grass. Looking back over the last several weeks, my impression is of at best a mixed Spring for birds. In southern Tasmania we've had one of the wettest (and windiest) Springs for several years, but after the extreme dryness of last Summer, I vowed never to complain when it rains. So far I've stuck to my vow. It has made birding something of a challenge and I often wonder what the impact is on our wildlife, and on the birds in particular. No doubt there are winners and losers. My impression is, after birding several sites around Hobart, of a decline in bush bird numbers, possibly as result of the last season's dry Summer. Migrant species such as Grey Fantail, Silvereye and Striated Pardalote certainly seem well down in numbers, and overwintering flocks of Silvereye were few and far between. Most of the returning migrants have arrived, but at the time of writing, I've yet to see or hear a Satin Flycatcher. The Pallid, Fan-tailed and Shining Bronze Cuckoos arrived much earlier than usual, although the actual arrival date of the latter two is somewhat obscured by overwintering birds. There are perils for early arriving migrants. I took this rather poor photograph of a rather dejected looking Tree Martin that had almost certainly just arrived (21st August). I was driving round the edge of Pipeclay Lagoon not long after sunrise on a frosty morning. The temperature was around zero Celsius, and with the stiff breeze the apparent temperature was several degrees lower. 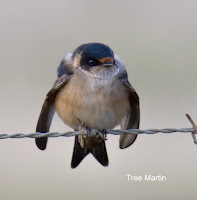 I caught sight of a group of birds sitting on a wire fence and as I drove closer, I identified them as mostly White-fronted Chats together with 5 Tree Martins, the first I had seen this season. I took a distant shot of one of the martins, giving what I thought was a fair impression of a penguin! All 'blown up" to retain body temperature, but as they feed almost exclusively on flying insects, they were in for a long wait. 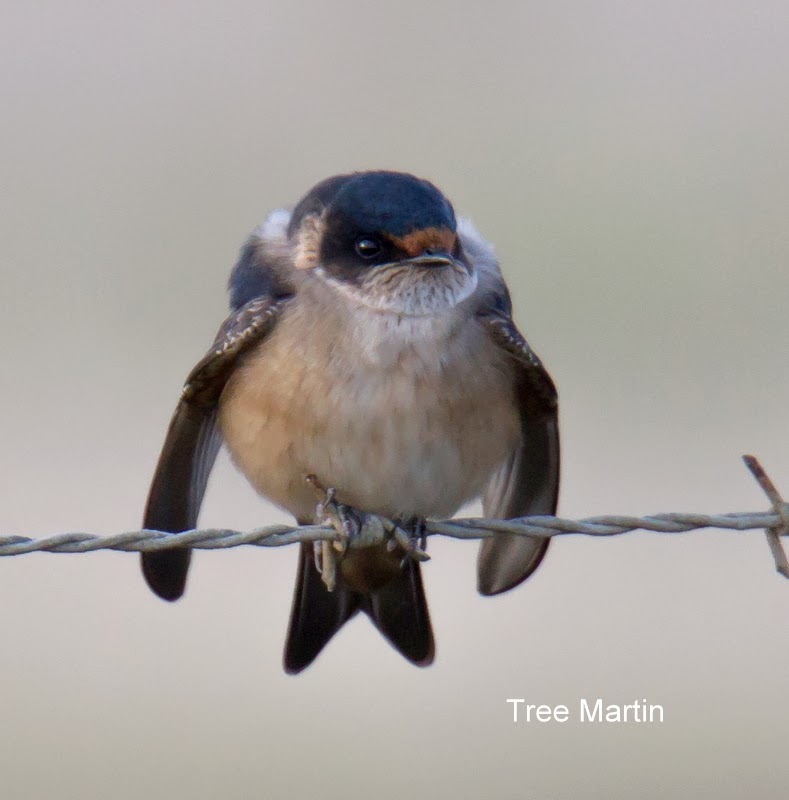 On the West Coast, where the colder and wetter days are more frequent, Tree Martins often forage for insects on the ground, something these 5 might have to resort to. 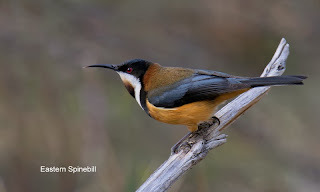 In late September there was a noticeable movement of Eastern Spinebills through gardens and bushland on Hobart's eastern shore, made more noticeable by their frequent calls, and at least they gave the occasional "photo opp.". 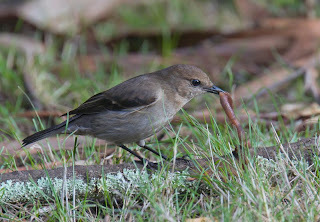 October is the main month that many bush birds breed and I've observed many collecting nesting material. Depending on the season ,breeding may extend into December and beyond. But there are a few early starters, and the Tasmanian Scrubwren is one. 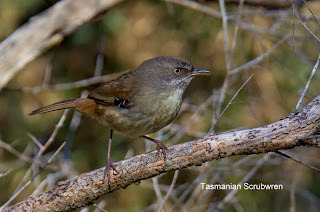 The scrubwren pictured gave me an unexpected chance of photography (they are great skulkers) and seemed unusually agitated. The "penny dropped" when I noticed a movement in the leaf litter and realised that I was close to their newly fledged youngster. I made a hasty retreat. There are definite signs of Spring about, the most obvious at the moment are the numerous Masked Lapwing pairs that have started nesting in various grassland sites. While for many, the arrival of the Welcome Swallows heralds Spring, I look forward to the return of one of our smallest birds, the Striated Pardalote. I visited Pipeclay Lagoon this morning, mainly looking at the migrant waders, Red-necked Stint, Double-banded Plover and Bar-tailed Godwit, but also looking for signs of our resident Red-capped Plovers and Pied Oystercatchers taking up breeding territories. I find that I can make a close approach to these waders in my car as they feed along the tide line, giving excellent views and the occasional photo.opp. Approaching a group of Red-capped Plovers, I wound down the window, and across the marsh came the umistakable "pick-it-up pick-it-up" call of a Striated Pardalote. "They're back!". I always find such events uplifting and something to be savoured, and set off in pursuit.. 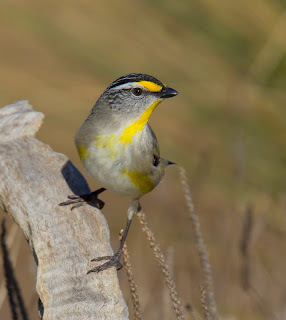 I've never seen large flocks of pardalotes, although they often breed in something approaching colonies, but their sudden appearance in substantial numbers suggests they cross Bass Strait on their southern migration from the Australian Mainland, in a cohesive way. None around a few days ago, many today. The Striated Pardalotes nest in holes, mostly in trees and banks, but at 'Pipeclay' they nest predominantly in holes in the ground. 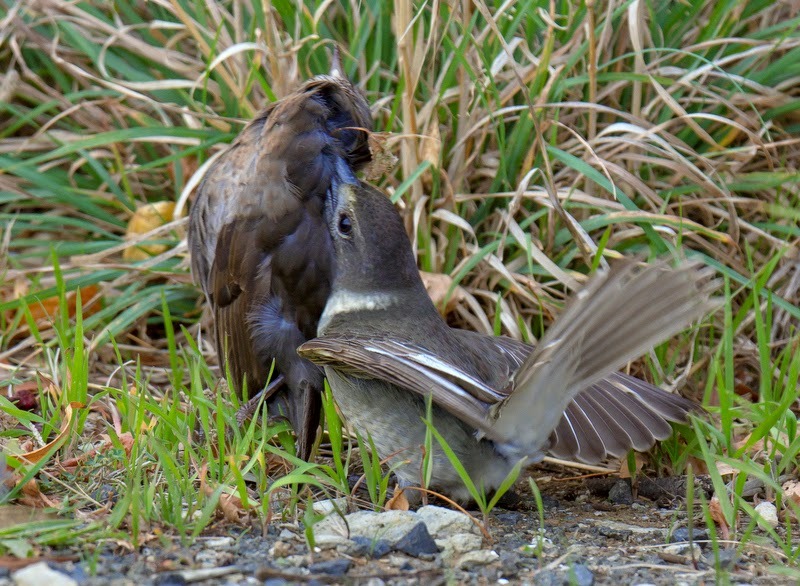 On arrival, pairs immediately take up a chosen site, having paired off during the preceding months, and their "pick-it-up" calls are announcing to others that this is their territory. Disputes do take place, but it's rarely more than threat displays with open wings, and incessantly calling. Although I've taken many photographs of them before, of course I couldn't help taking a few more and quickly found an occupied territory. There were 2 pairs in close proximity that were having a vocal joust and allowed a very close approach. On 3 occasions all too close, as one bird used my hat as a convenient observation point, I being the tallest "structure" around! I could only look at my own shadow with bird atop-- gives you a warm fuzzy feeling. 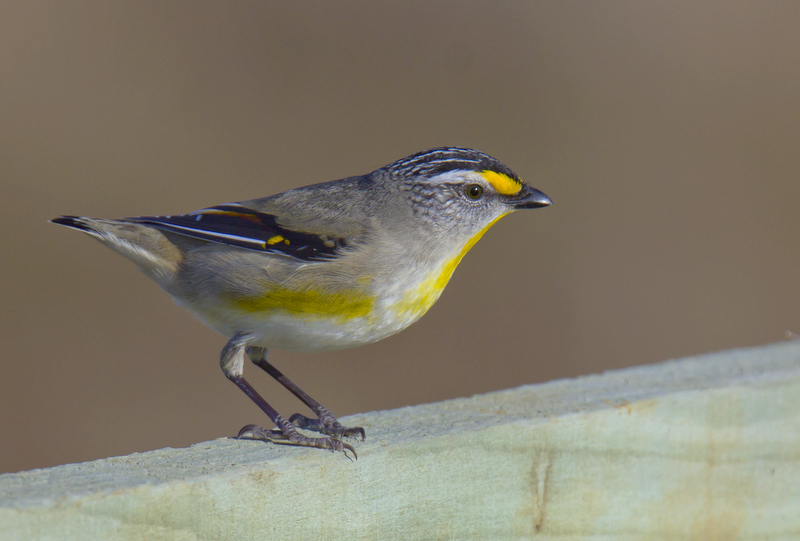 Of Tasmania's three pardalote species, the Striated is the only migrant. In some years a good part of the population stays in Tasmania during Winter, but this year they departed early, and I haven't recorded any since March.Welcome back. Somewhat frustrated by recent weather conditions, I opted for an early morning visit to the Waterworks Reserve at Dynnyrne, a Hobart suburb, which I hoped would be sheltered from the strong south westerlies. In retrospect I think I might have been a tad too early, with frost still present on the downstream face of the dam and few birds in evidence, but I was optimistic. I've often been able to photograph birds from the car here, and that's one of the attractions, but I wasn't quite "tuned in" yet and failed to see a roadside Common Bronzewing presenting a photo.opp. or the Grey Currawongs or the Forest Ravens. It was going to be one of those days! I did notice the group of around a dozen Hardhead ducks roosting on the water's edge, and a few Coot and Hoary-headed Grebes nearby. 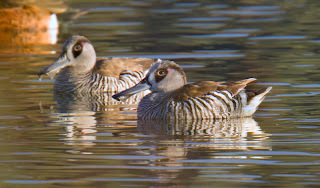 Normally considered an uncommon species in Tasmania, Hardheads have been seen around Tasmania in unprecedented numbers this year, and have turned up on many bodies of water, including farm dams. 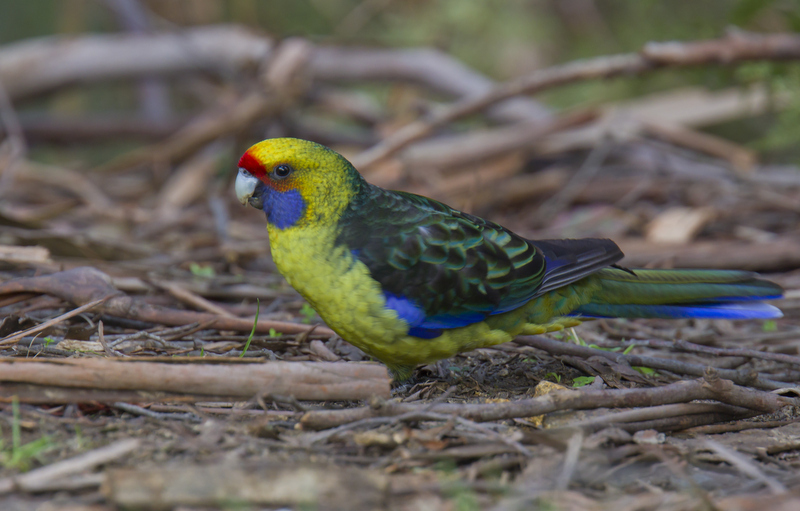 I recently noted around 90 on Rostrevor Lagoon near Triabunna and a few dozen on Risdon Brook Dam. Spotting a pair of Dusky Robins perched on the top of star pickets around a construction area--I believe it's going to be a handicapped friendly BBQ area--I wandered closer, noting a pair of Scarlet Robins doing the same thing. I had thoughts of photography, but that was cut short by the arrival of the construction crews and the departure of the robins, and me. There's an area near the reserve's entrance where I can usually find Dusky Robins and I retreated to this spot. My first impression was one of ominous silence, which didn't bode well, but I persevered. I soon flushed two Forest Ravens, and assumed they were the reason for the lack of bird activity. A Yellow-throated Honeyeater called from high in the canopy, but little else. A few steps more and there was the culprit, a Laughing Kookaburra, the bane of many small birds. 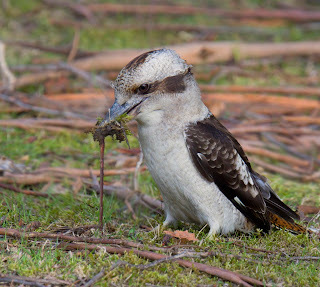 Kookaburras were introduced into the Tasmanian Midlands around 1906 and have steadily spread throughout the state and are now commonly seen, even in suburban gardens. Patient birds, they will sit on a suitable perch watching for minutes on end, before pouncing on some unsuspecting prey, including small birds. I took several shots of it perched and moved on, but I'd only taken a few steps before it dropped to the ground. Hidden from my view by a tree, I retraced my steps, interested in what prey it was after. As you can see from the image, it was a worm and a protracted tug of war ensued, and my proximity wasn't going to inhibit its efforts. Worm devoured, it resumed its perch, but seconds later, a second kookaburra passed over my head, and it set off in pursuit. 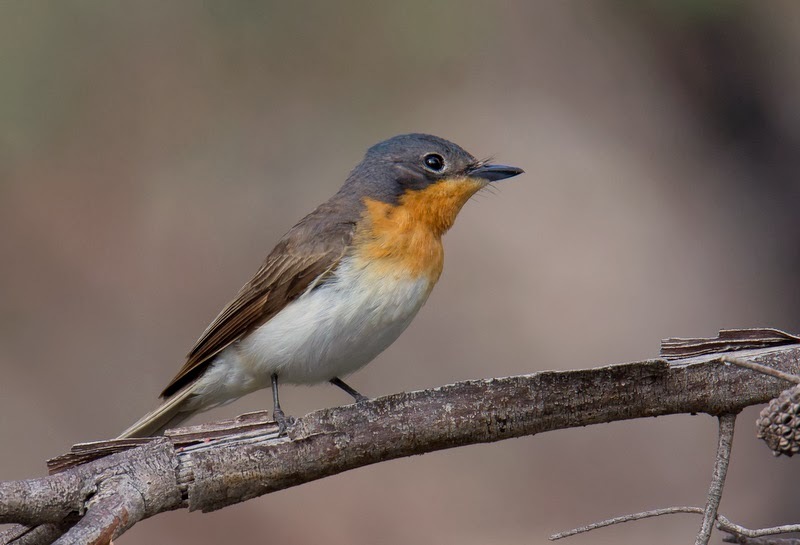 Their departure seemed to breathe new life into the bush and Dusky and Scarlet Robins emerged, together with Superb Blue-wrens, while above in the canopy, Strong-billed and Black-headed Honeyeaters chattered away. The occasional Golden Whistler sidled quietly through the nearby scrub as did Brown Thornbills. I briefly investigated a peculiar rasping call I couldn't identify emanating from high in the eucalypts. That turned out to be two pairs of Wood Duck probably looking for nest holes. I still find it strange to see ducks in trees. There were at least 8 Dusky Robins feeding in and around the clearing. Most were feeding deep in the understorey scrub, but a few were making forays from low branches, patiently waiting for some movement in the leaf mulch before pouncing, while others were actively searching the ground and I was able to get a few shots. Most of the prey appeared to be very small insects. I stood quietly beside a large gum and was finally "rewarded" by a close approach of the Dusky Robin pictured. It stood on a fallen branch for a few seconds, before disappearing into the grass and reappearing with a worm. 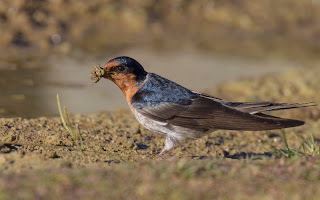 It always strikes me that worms are rather a large prey for robins, but I've seen all 4 of our robins feeding on worms. 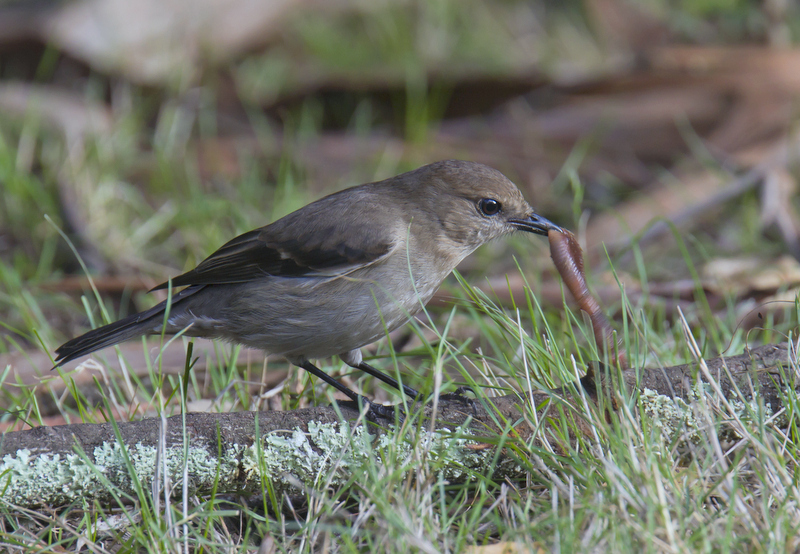 I suspect they are 'opportunistic' prey rather than sort after, but Dusky Robins also take skinks (small lizards), certainly more 'substantial' than worms. 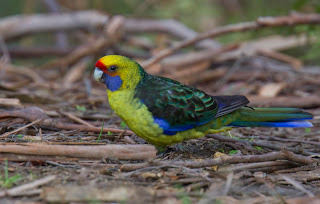 My photo.opps were not quite over as, while watching the robins, a pair of Green Rosellas (like the Dusky Robins only found in Tasmania) that had been feeding beneath the nearby acacias, repositioned close by. Actively feeding, probably on seeds, one coming to within a few inches of my foot, before realising its error! But it only flew a few metres and gave me my chance. My only regret was that it was in such deep shade (1/30th of a second exposure!) . Despite an inauspicious start, an excellent morning's birding. About 4 weeks ago, a report of yet more vagrant ducks at Gould's Lagoon at Granton in southern Tasmania, found me scurrying off to hopefully find them. The focus of my search was 5 Pink-eared Ducks. With only a handful of previous records, they are a decided rarity in Tasmania, and I fully expected to find a 'crowd' of birders, or whatever the colloquial term is for a group of birders--I can think of a few! Not a birder in sight. I had the lagoon to myself. 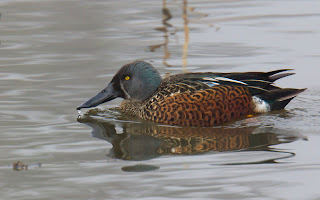 A walk along the roadside between the two halves of the lagoon failed to locate any of the Pinkears among the numerous Australasian Shoveler, Grey and Chestnut Teal, a few Hardhead and the Freckled Duck mentioned in the previous blog. I didn't venture into the far northern end of the main lagoon, reasoning that they were unlikely to be among the many "ferals" that roost there. On to the hide for a quick.look at the ducks hanging out there, but still no sign. I decided to walk up the hill near the cormorant roost to overlook the lagoon, thinking that would be my final chance. So I was disappointed that there was still no sign of my "quarry" from this vantage point either. I was just about to give up and head back to my vehicle when, steaming from behind the hill, in line astern, the Pink-eared Duck came into view. Satisfaction and relief! They had been among the ferals at the northern end--a lesson for next time. They were mid lagoon with bills and heads in the water up to their eyes as they powered past, apparently a normal feeding method. This is a unique looking duck, with its' strangely shaped, oversize bill, large markings around the eye and striped body, quite unlike any other Australian duck. I've seen this duck in Tasmania and on the Mainland, but it had never occurred to me why it was called "pink-eared". It was only after looking at the images on my computer some hours later, that I could see the small "pink ear" just behind the eye. They are also called Zebra Duck for obvious reasons. A hundred metres from me they joined a score of Eurasian Coots feeding mid lagoon. The Pinkears feed on microscopic invertebrates and seed, and often 'spin' while feeding, creating a vortex and thus drawing up food particles from below the surface. They have a bill adapted to filtering out food as they skim the surface of the water. I've seen Australasian Shoveler using a similar method. I returned to my earlier spot along the roadside, hoping I would be closer to the "action" and might get a photograph or two--I wasn't and didn't. I waited for 30 minutes or more, hoping for a photo.opp., but just to add to my 'misery', they stopped feeding and sat on the water with heads tucked into their bodies and slept. This small flotilla slowly passed down the lagoon wafted by a light breeze, but gave no chance of worthwhile photography. I did manage to get a distant shot on another visit, shown at top. Reading up about these ducks, they're described as "often quite tame". I don't think these birds have read the same information! The likely explanation is that they have been shot at or at venues where duck shooting has taken place. They are wholly protected in Tasmania. Having written frequently about various rare visitors that have graced Gould's Lagoon this year, I should mention that 'Gould's' is also home to many Australasian Shoveler (male lower image), particularly at this time of year. It's possibly the best and easiest place to see these duck anywhere in the state. I recently counted 40 pairs roosting here, some with the ever burgeoning numbers of Freckled Duck--19 at a recent count.